So Nick has learned that sometimes I will just go down a rabbit hole and stop everything I'm doing to work on one project. Since I got my new sewing machine Astrid (you know a Viking name for strength) I've been wanting to make a table so I have more quilting space, and have a table that is the proper height sewing. So! I made one....and it turned out PERFECT!! I first scoured the Pinterestverse for a good tutorial and then went to work! I used this tutorial from From Martha With Love. I did make a few modifications the biggest being a swapped out the legs that came with the Ikea table for ones I made myself with some 2x2s. I turned our dining room area into a construction and painting zone and went to work. I had to trace my machine a few different times to get the right placement. Testing it out to make sure its the right height with my chair before I move forward with painting it. Because of the shape of my machine I also made this little wedge so I wouldn't have a space in front of my machine to lose everything in. This took lots of finagling and use of my handy dandy new sander. And into the sewing corner it went! Facebook Memories can be tough at times, but today it reminded me that I finished my first quilt 9 years ago. In 2009 I was living in St Louis with my sister. Working at a job that I didn't love (and within a few months would leave and move to Columbus). I had purchased a cheap Singer sewing machine at Kohl's and decided that I was going to make a quilt! I had no idea how to make a quilt. I knew how to work a sewing machine because when I was younger I would use my Mom's to make draw string "prairie skirts" because I wanted to be Laura Ingalls Wilder. But, hand no idea how to make a quilt. I found a free pattern for a patch work quilt and decided that I would make that. I went to Hobby Lobby (...I know...) and got fabric for this quilt. I got the most inexpensive I could get because I also didn't have a lot of expendable cash at the time. I got a mix of solids and prints. When I got home I cut everything up with scissors...who knew what a rotary cutter or mat were...and those are expensive! I sewed away while I probably should have been working and finished the quilt top in a few days. Again, didn't know how to finish it. So I got some batting and a backing and turned it inside out and sewed around it and then flipped it. Again, didn't know that quilting it was a thing. So I tied it with some embroidery floss. And here it is in all of its 2009 Blackberry camera glory. Oh how far we've come! 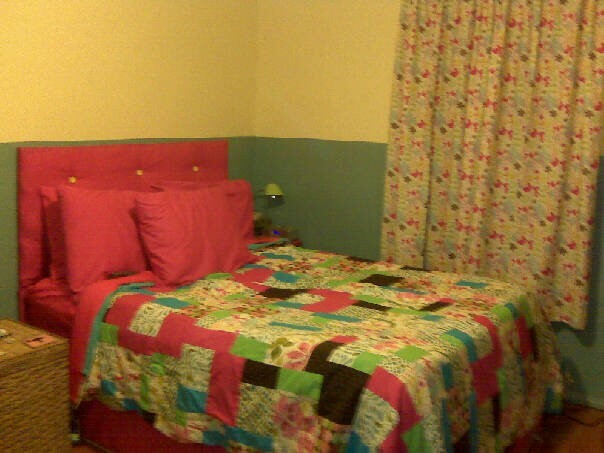 After I made the quilt, if you know anything about me I couldn't stop there....so I made curtains, that lovely headboard, and pillow cases (again...no idea how to do that) and decorated the whole room. That was the only quilt I made until a little over a year later I found myself unemployed (that damn 2010 election didn't go so well) and living back at my sisters going stir crazy. I still have the quilt. It moved with me and kept me warm at my Columbus apartment. And while it isn't the prettiest thing you have ever seen, it's still a pretty great first quilt if you ask me! Last November I knew I would have some downtime around the Holidays at work, and I was trying to think of things that I could take back and forth with me between work and home. I had purchased the book and templates for the La Passacaglia Quilt a year or so before hand....but everything was so little and I was intimidated to start. I pulled out the fabrics that I had used in my Philadelphia Map Quilt a few weeks before and decided to use those as my starting place for the La Pass. I would make all of the little tiny triangles out of Navy. And I was only going to have a few fabrics that I fussy cut to make it easier. Over Thanksgiving I cut lots and lots and lots of fabric. And started stitching at work. I've worked on this project mostly during downtime at work with the occasional stitching at home. There are a few things I've found or been introduced to through this process. 1) Ziploc bags are the best for storing this project. But IKEA has some great cute bags. 2) The Purple Thang is amazing! Who knew this little gizmo was out there? 3) I've accepted the fact that you will see my stitches on this project. Mostly because I know I put in every one of those stinking stitches! 4) I have no timeline for this project. It will get done when it gets done. And I am enjoying the process. 5) Copy the pages of your book so you can write all over them and mark off when you've finished up a Rosette. Our Guild does a yearly swap. This year we swapped the Pincushion and Thread Catcher that Elizabeth Hartman designed for Sew Mama Sew . I've made this pattern a few times, and each time I think I want to keep it for myself! Well since we are swapping I'll finally get one too!!! Mine went to my friend Bobbi, who happens to collect stamps, so the fabric is perfect for her!! I got this super cute one from Jen, who is a newer member of the Guild. I love the combination of fabrics! I've been jamming on these turquoises with the light pinks lately. I want to make all of the quilts with them....but alas I have commissions I have to finish first. I also made this other bag the Crochet on the Go Bag. My co-worker is crocheting me some slippers that I've always wanted, so in exchange I surprised her with the Crochet on the Go Bag! She is also traveling a lot for work right now, so she can take her projects with her wherever she goes! When a friend posts on Instagram that she has written her first bag pattern and is looking for pattern testers, I immediately raised my hand and said "Oh me!" If you know me, you know I am always looking for a new bag. My friend Bobbi says that whenever I finish a bag my review is always "it's great it fits all of my stuff!" But this one really is great! I made the medium sized bag, but the pattern comes in 3 sizes. This bag is definitely doable for a confident beginner, Dana's instructions are easy to follow and walk you through step by step. 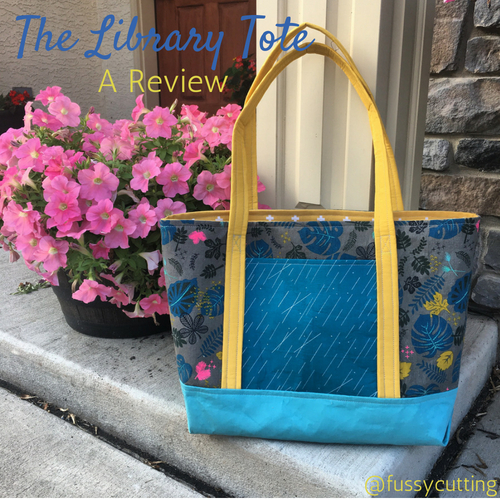 Hope you enjoy and get to making a Library Tote!! Craft Show Prep...in 8 Days!! I have been thinking about doing craft fairs for a long time. I always gave myself excuses for why I couldn't do them. I didn't have enough time, I didn't want to give up my Saturdays, people wouldn't want to buy what I made. Well, a week ago I decided "what the hell just do it!" So I found a reasonably priced Craft Fair and signed up! I had 8 days to prepare....and boy did I work for those 8 days. Nick was so sick of hearing my sewing machine constantly going, I've agreed that there will be zero sewing until I go to my quilt retreat this coming weekend. I made burp cloths, bandanna bibs, wooden teethers, lovey blankets, and pacifier clips....and I made SO many of them. I displayed quilts as examples of what I would do as a custom order. And I had a great conversation with an 8 or 9 year old about the Philadelphia Map Quilt. She was very interested in how things were laid out and the colors and the fabrics. This corner is my favorite of the ones that I've made. The Halloween fabrics on baby items just makes me giggle. Now I've got plenty of inventory. Everything will be going onto the Etsy shop in the coming days. And I'm signing up for more craft fairs already! Thanks to Nick for putting up with my sewing. Thanks to Nicole for letting me borrow her tables (I will now be purchasing my own). Thanks to the old couple next to me who kept me entertained. And thanks to everyone for the words of encouragement over the past week. The Plus Baby Quilt is my go to for new babies in my life. I think they are super cute and can be done in so many different ways! I of course love making it in all of the bright colors! But, it could be made with low volume fabrics with a pop of color, or all done in one color family. Its also a great way to just show off some of your favorite fabrics. This second one I did was a custom order. The client wanted to use her bridesmaids dress for her friends wedding for the baby quilt I loved this idea. The solid light pink is the dress. I used fabrics that I thought went well with that pink, but didn't distract from it. Overall, I think the plus quilt is a great everyday quilt for anyone. You can dress it up or dress it down and get the end product that you want. If you're interested in ordering a Plus Baby Quilt you can head over to The Fussy Cutting Quilt Shop on Etsy and order one! This quilt started as just that small circle in the middle. I took a short class from Sarah Bond (@slbphilly on Instagram) at a sewing retreat, she teaches this class called Release the Geese. I had seen what she did with these geese before and loved them. So i made the first round...but I knew I didn't just want to make a quilt that was concentric circles. So off it went to the WIP bin for a few years. Then, PhillyMQG started round robins up again, I said oh I'll throw my circle in there...someone can add something to it and then I'll see where it goes. Well...Sarah took it! So she added more geese to it and off I went again! It sat on my design wall for a few days before I decided it needed curvy borders. I started with the green curve because I knew that I could add one row inside of it and rows to the outside if I wanted to. Off I went making arc after arc after arc. Figuring out the clockwise or counter clockwise as I went. Then I decided it needed insides and outsides. So off I went making a million more geese, but I didn't have enough of the original charm packs left, so I just used the fabrics that I had the most of. I made pile after pile of arcs...but I think paper piecing is awesome because you can just pick one up when you have a few minutes of sewing time and you know where you started or stopped. Then I finally had enough! I had to figure out "how the heck do you put this thing together??" So I pieced together all of the arcs. And then I sort of had squares! After 3 attempts at putting the whole quilt top together off to Emily it went for quilting!! She is awesome you can find her over at Emerson Quilting. All I told her was something to emphasize the different directions of the geese. It turned out awesome! And then it was bound and finished!! All in it was 3 years in the making, in reality I got it back from Sarah in February, I really started making the geese in August/September and it was finished at Thanksgiving. It was a massive labor of love. I have been hoarding these Amy Butler fabrics for years to be used on something special. So far I've made 2 quilts with the fabrics.